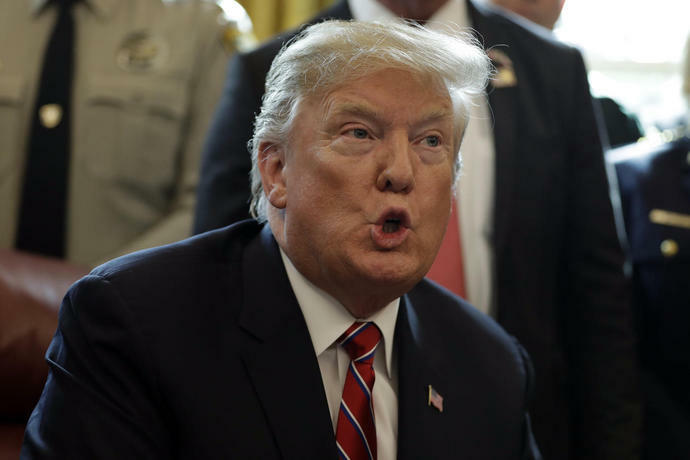 NEW YORK (AP) - President Donald Trump played down any threat posed by white nationalism after the gunman accused of the New Zealand mosque massacre called the president "a symbol of renewed white identity." Trump, whose own previous responses to the movement have drawn scrutiny, expressed sympathy for the victims who died at "places of worship turned into scenes of evil killing." But he declined to join expressions of mounting concern about white nationalism. When asked whether he thought it was a rising threat around the world, he responded, "I don't really." "I think it's a small group of people that have very, very serious problems, I guess," Trump said Friday. "If you look at what happened in New Zealand, perhaps that's the case. I don't know enough about it yet. But it's certainly a terrible thing." Trump was asked about white nationalism and the shooting deaths of 49 people at mosques in Christchurch after he formally vetoed Congress' resolution to block his declaration of a national emergency at the Mexico border. His veto, aimed at freeing money to build more miles of a border wall against illegal immigration, is expected to survive any congressional effort to overturn it. Questioned about the accused gunman's reference to him, Trump professed ignorance. The man accused of the shootings left behind a lengthy document outlining his motivations. He proudly stated that he was a 28-year-old Australian white nationalist who hates immigrants and was set off by attacks in Europe that were perpetrated by Muslims. He mentioned the U.S. president in a single reference. "Were/are you a supporter of Donald Trump?" was one of the questions he posed to himself. His answer: "As a symbol of renewed white identity and common purpose? Sure. As a policy maker and leader? Dear god no." The White House immediately denounced the connection. But the mention from the suspect, who embraced Nazi imagery and voiced support for fascism, nonetheless cast an uncomfortable light on the way the president has been embraced by some on the far right. Trump, who as a candidate proposed a ban on all Muslims entering the United States, has drawn criticism as being slow to condemn white supremacy and related violence. After a 2017 clash between white nationalists and anti-racist protesters in Charlottesville, Virginia, that left one demonstrator dead, Trump said there were "very fine people on both sides" of the confrontation. He also did not immediately reject the support of David Duke, a former KKK Grand Wizard, during his presidential campaign. Some of the Democrats who are campaigning for the right to challenge Trump in 2020 criticized his response to the New Zealand attack. Sen. Amy Klobuchar told Iowa voters Saturday that "it's our job to stand up against" white supremacism. Washington Gov. Jay Inslee, who is also seeking the Democratic presidential nomination, accused Trump of taking "rank with those who want to spread fear and division across the world." Former Texas Rep. Beto O'Rourke, who entered the Democratic race this week, said, "We must call out this hatred, this Islamophobia, this intolerance, and the violence that predictably follows from the rhetoric that we use." The White House rejected any link to Trump. "It's outrageous to even make that connection between this deranged individual that committed this evil crime to the president who has repeatedly condemned bigotry, racism and made it very clear that this is a terrorist attack," Mercedes Schlapp, the White House's director of strategic communication, told reporters on Friday. "We are there to support and stand with the people of New Zealand." Trump telephoned New Zealand Prime Minister Jacinda Ardern, offering condolences, prayers and any help the U.S. might be able to provide. She told reporters she answered, "My message was: to offer sympathy and love to all Muslim communities." Trump's hardline immigration rhetoric and calls to return America to its traditional past have been embraced by many on the conservative fringes, including some who troll online with racist imagery, as well as white supremacists who have looked to engage in violence. In Florida, Cesar Sayoc, who had decorated his van with Trump propaganda, was accused of mailing explosives last fall to Democratic Party officials and media members, many of whom had been criticized by the president. The president said Sayoc had been "insane" long before he became a Trump fan. Last month, a former Coast Guard official was accused of stockpiling weapons in a plot to kill media figures and liberal politicians as part of a plan to transform the U.S. into a white ethno-state. It took more than a week for Trump to respond to the plot, which he deemed "a shame." Many experts who track violent extremists have identified white nationalism as a growing threat in the U.S. and abroad. In January, for example, the New York-based Anti-Defamation League said domestic extremists killed at least 50 people in the U.S. in 2018, up from 37 in 2017, and said, "White supremacists were responsible for the great majority of the killings, which is typically the case." Associated Press writers Jill Colvin and Michael Kunzelman in Washington and Alexandra Jaffe in Mount Pleasant, Iowa, contributed to this report.